NETWORK FINALS: DYNASTY lost 0.1 in final numbers, returning to the 0.1 level. CABLE HIGHLIGHTS: ESPN’s NBA PLAYOFFS games took the top slots on Friday cable with 1.15/1.04, while NBC Sports Net owned the bottom end of the Top 10 with the NHL PLAYOFFS at 0.30/0.30. A&E’s LIVE PD rose 0.04 to 0.64. On HBO, REAL TIME WITH BILL MAHER climbed 0.09 to 0.38, and WYATT CENAC’S PROBLEM AREAS was steady at 0.08. On Discovery, GOLD RUSH ticked up to 0.43, and BERING SEA GOLD was down 0.06 to 0.30. MSNBC’s RACHEL MADDOW SHOW led cable news at 0.29/0.44/2.7M, above Fox News’s THE INGRAHAM ANGLE at 0.22/0.39/2.3M and CNN’s ANDERSON COOPER 360 at 0.18/0.24/900K. Univisioon’s LIGA soccer match was at 0.28. Nickelodeon’s noon PAW PATROL was at 0.26, and its 6PM LOUD HOUSE was down 0.03 to 0.22. Cartoon Network’s early evening TEEN TITANS GO was at 0.22, and AMAZING ROAD OF GUMBY was at 0.23, compared to last week’s 0.19. 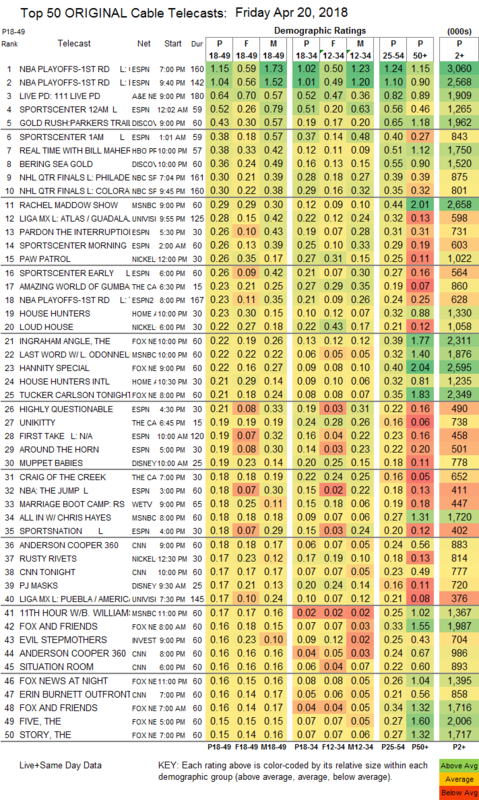 On HGTV, HOUSE HUNTERS dipped 0.03 to 0.23, and HOUSE HUNTERS INTL was down 0.06 to 0.21. On We, MARRIAGE BOOT CAMP ticked down to 0.18, and BRIDEZILLAS held at 0.12. ID’s EVIL STEPMOTHERS shed 0.02 to 0.16. 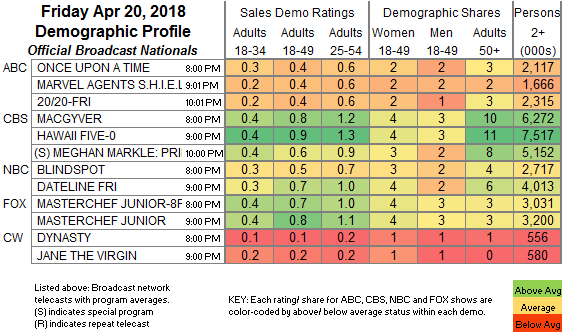 Cinemax’s RELLIK stayed off the chart, but gained 0.02 to 0.03/88K.